To be informed about the release details of this book, and also future publications, you will need to sign up to our Newsletter. We will only contact you very occasionally with information about our forthcoming publications. Thanks. Between 1960 and 1964, the legendary Roger Corman created eight motion pictures that have become known as the “Poe Cycle,” elevating the careers of both himself and Vincent Price to cult status around the world. Nearly half a century later these films are staples in most DVD collections of anyone who admires the cinema of the Fantastic. These films introduced the works of Poe to an whole new generation. Includes perspectives from many who have worked on these classic films. 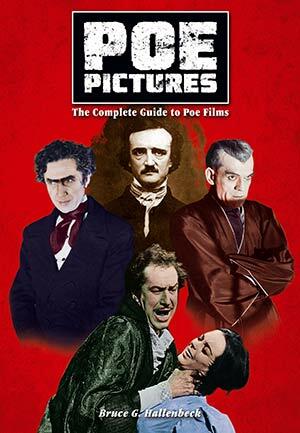 Bruce Hallenbeck has fashioned a film by film analysis of Poe-inspired films, including Corman’s classic AIP series. The unique insights into the literary/cinematic landscape of Poe now culminates in Poe Pictures – The Film Legacy of Edgar Allan Poe. Poe Pictures – The Film Legacy of Edgar Allan Poe is the required reading for both aficionados of these films and also those wishing to pursue a more serious study of Poe’s influence on the cinema. These films have never left the imagination of the generation that grew up watching them.